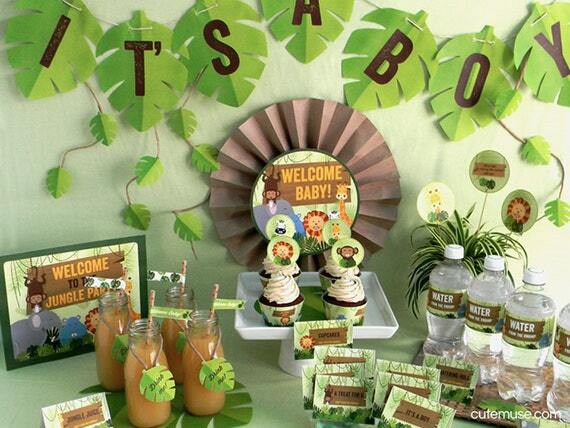 Get WILD with excitement with this Jungle (Safari) Animals Theme Baby Shower Decorations Printable Party Kit - INSTANT DOWNLOAD perfect for welcoming a baby boy or girl. Cute animals with pacifiers and a cute monkey hanging from the tree with his milk bottle. This collection comes with 6 PDF files. One extra PDF with the instructions and with security password included. Your purchase selection includes the following items delivered in a digital PDF file format. - Instructions with password included. - 2" circle toppers – use as cupcake toppers, favor tags, envelope sticker, and more. - 3" circle toppers – use as cake toppers, tags, banner, etc. After your purchase, please, fill out on the "notes to seller" box submit the information needed to create your designs. Within 1-2 business days after I receive your information, I will email you the first proof. Three free revisions are included with your purchase. Any extra proofs will be charged an additional fee ($5.00 USD / proof). After approval any revisions will cost $5.00 USD. Once you approve your designs, I will email you the final PDF files ready-to-print. After approval any revisions will cost $5.00 USD. Please check your Drafts carefully before approving them. Always print a sample and check it thoroughly before printing all your invitations! You can print out these designs at home or at a local printer as many times as you like. There's no price difference whether you print. Each file come as a printable PDF set up on an 8.5"x11" size page that you print yourself. Files will be emailed to you after approval. Once you approve your designs, I will email you your final invitation files in ready-to-print PDF or JPG format. After approval any revisions will cost $5.00 USD. The templates also will come with trim mark guidelines, so you will know exactly where to trim. Font changes are not available with this party package. I do not proofread your personalized stationery/party printable package wording and I am not responsible for any misspellings after the final proof is approved by the buyer. If you have questions or would like any assistance with an order, please contact me at hello@cutemuse.com. I will be happy to help!